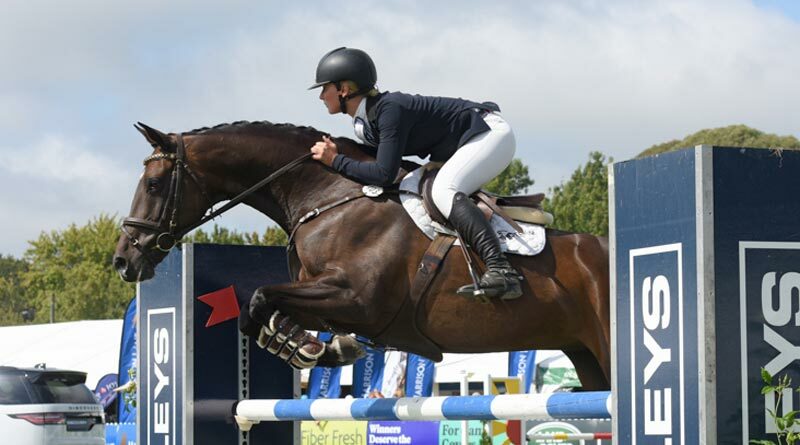 New Zealand’s Horse of the Year show ended on Sunday after six days of competition in Hastings. Here are the main results. The show’s eventing section featured several visiting international riders, but it was local rider Amanda Pottinger who took out the Eventer of the Year title with her 4* win on Just Kidding. Second was Madison Crowe and Waitangi Pinterest, with Blyth Tait taking out third Cor Jet. Tait had ridden the horse, on loan from Chloe Phillips-Harris for the first time only a few days ago. Tim Price ended up finishing in 7th place on Ricker Ridge Escada, whereas Jonelle Price elected to retire after Ricker Ridge Divine Right pulled a shoe and had two stops on the cross-country course. Kiwi rider Donna Edwards-Smith and DSE Mr Hokey Pokey fell at the third element of fence five, the combination in the main arena. Smith was taken to Hastings Hospital for tests and was there as the hospital went into lockdown following a bomb scare. She was later scanned and cleared. The CCI3* was won by Samantha Lissington on RR Sooty GNZ. Monica Oakley was second on Festival, her third ride in the class, and the only horse inside the time, with Amanda Pottinger third on The Comedian, Louise Mulholland fourth on Mr McTaggart, Monica fifth on Man of Honour. Jock Paget rode Lissington’s RR Riley into seventh spot. Tegan Fitzsimon was probably the hot favourite on Windermere Cappuccino and they jumped practically foot perfect in the first two rounds. They were first to jump-off and Tegan certainly set the competition up with another perfectly jumped round in what looked like a useful time. The pressure was therefore on the next competitor, local favourite Melody Matheson and 9-year-old Cortaflex Graffiti MH. Matheson delivered, cutting the corners, gunning it to the last fence, and cleared everything, with a time 1.5 seconds faster than Tegan but there was one more competitor to come. Belischi HM was on fire when it counted for Hayward, and they flew around the course half a second faster than Matheson who had to settle for second, with Fitzsimon third. Hayward also won the Young Rider of the Year earlier in the show as well as last year on Yandoo Lady Gold. She had also previously won the Junior and Pony Show Hunter Horse of the Year titles, as well as the Aspiring Rider title a number of times. This was the fourth time jumping in the Olympic Cup so she was delighted to have won the top prize. Wendi Williamson and Don Amour MH have won their first Dressage Horse of the Year in Hastings. Jessica Collinson and Ngahiwi Cruise had the only two clear rounds to take out the Junior Rider of the Year title. Ngahiwi Cruise has won this class in 2016 with his previous rider, Steffi Whittaker, from Canterbury. This year there were eight young riders called back to jump-off, six of them having recorded clear rounds in the first round, and two having four faults. Collinson was last to go and the other combinations were sitting on four faults, and her clear round won her the title. Olivia Apatu and Alazaan Arzu were the only combination to produce two clear rounds to take out the Pony of the Year title, for the second time. The 15-year-old’s win was tinged with sadness and when presented with her trophy, Olivia made a special mention of her father, who was tragically killed in a helicopter crash in June last year. Amanda Burton has been after the Ridden Standardbred of the Year title for some time. She has won the in-hand title before and she’s finished runner-up as well as third in the ridden section but it was her year this year and she has finally nailed that title on Change of Pace. Shannon Armour and Macklemore made the trip all the way from Invercargill and were rewarded with runner-up. It was her first time competing at the show. Mikayla Herbert took out the Lady Rider of the Year title on her nine-year-old warmblood gelding Grand Caballo. The Rotorua combination has been together for three years, starting their career in seven-year-old and Young Rider classes. There were eight combinations who came back for the second round, and four of them went clear but it was only Herbert who managed the double clear. Tegan Fitzsimon and Double J Monarch also produced two double clear jumping rounds, but that one time fault incurred in the first round proved to be very expensive. Matamata’s Vicki Prendergast and Selena C were clear winners with the only clear round against the other seven competitors in the jump off. Runner up in the class was Queenstown’s Grace Percy and Kiwi Spirit. Siobhan Ryan and Natalie were unlucky when they knocked the last fence down, so had to settle for third. Last year’s winner, Sally Clark and Victoria’s Secret, had an unlucky rail, finishing in fourth place with Lucia Voss and Ngahiwi Para in fifth. Emily Hayward and Yandoo Lady Gold retained their title from last year. Two riders made it through to the jump off after two rounds, and when Hayward had a rail down early in the course she thought she had handed the competition to Norwood Gold Cup winner Oliver Croucher on Waitangi Surf. The combination was looking great over the first few fences but then disaster struck, as they jumped the wrong jump and were therefore eliminated, handing the win to Hayward. There was another hard luck story in the competition as Steffi Whittaker jumped two clear rounds in the competition riding On the Point Eve but incurred one time fault in the first round, so she had to settle for third place. Elmo Jackson was fourth on Animation, with Sophie Scott on Lakato fifth.